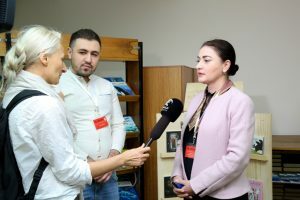 On October 19, 2018 the representatives of the Arabic Kalimat foundation were in Armenia. 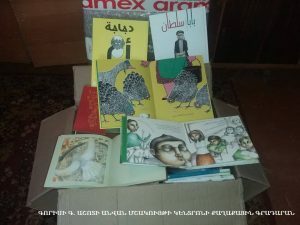 In cooperation with ALA (Armenian Library Association) they donated 1000 Arabic books to Armenian libraries. 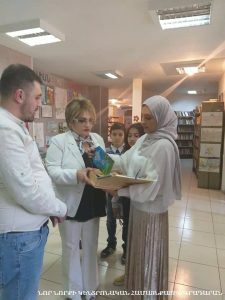 On October, 100 Arabic books were donated to National Children’s Library after Khnko Aper, Nor Nork Central, Armavir and Aragatsotn regional libraries together with mobile bookshelves. 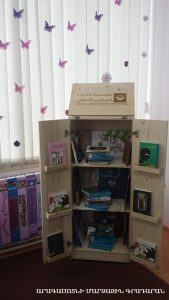 In November and December the process of donation of books and mobile bookshelves continued and was later summed up. 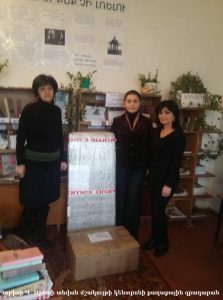 Kotayq’s, Syuniq’s , Vayoc Dzor’s, Tavush’s, Shirak’s regional libraries were replenished with 100 Arabic books. 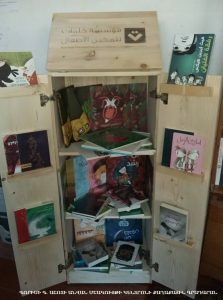 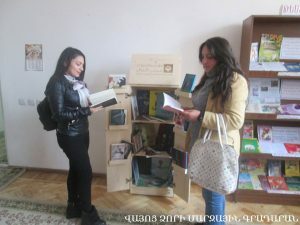 On November 23 the library of G. Ashot Cultural Center accepted the present of books together with a mobile bookshelf on closing ceremony of “Goris: CIS Cultural Centre 2018” international program. 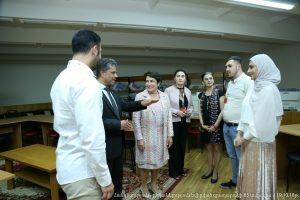 On October 17-21, 2018 the director of Music Fund of Ufficio Ricerca in Milan Massimo Gentili-Tedeschi visited Armenia. 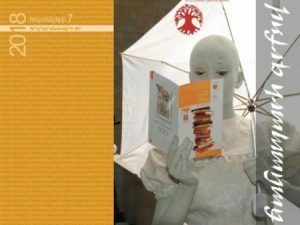 Enclosed is his report. 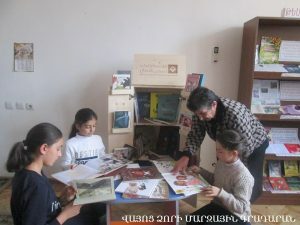 This year the National Children’s Library after Khnko Aper celebrated the 85th anniversary of its foundation. 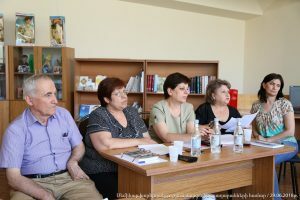 Within the scope of various events devoted to the 85th anniversary of the library scientific-practical meetings took place. 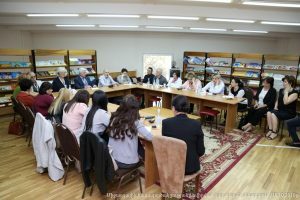 On October 17 a conference took place with the participation of foreign guests. 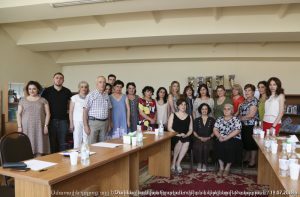 The speakers of the meeting were the head of the UFFICIO Ricordi Music Foundation Massimo Gentili Tedeschi, who spoke on catalogisation and modern skills necessary for the librarians, IBBY Executive Director Liz Page, who spoke on the activities of IBBY National Sections in promotion of reading and evaluated IBBY Armenia as an active participant. 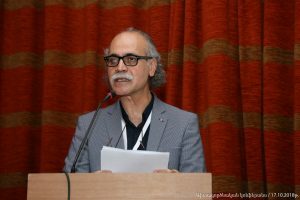 The Iranian children’s writer Farhad Hasanzade presented his way of writing for children. 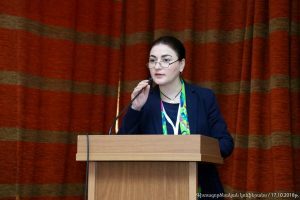 Gayane Karapetyan spoke about National Children’s library activity. 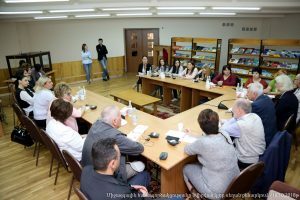 On October 18 a round table-discussion with the heading “Prospects for cooperation: IBBY, IFLA, IAML” was held. 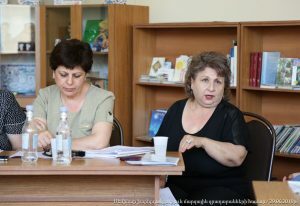 Libraries’ directors, young specialists of the sphere were present. 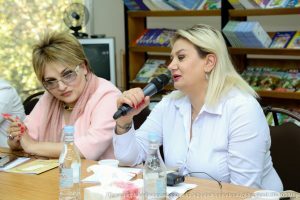 The director of National Children’s Library R. Tonoyan spoke on the implemented programs within the cooperation of IBBY, IFLA, IAML, in the context of which IBBY Executive Director Liz Page mentioned that IBBY Armenia was founded in 2012 and talked about important programs which were implemented together during this time. 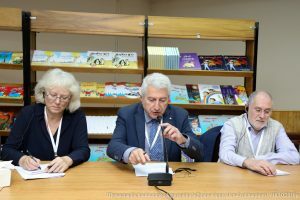 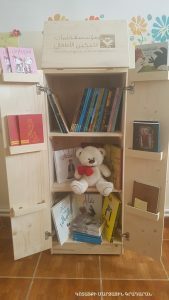 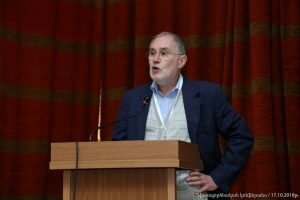 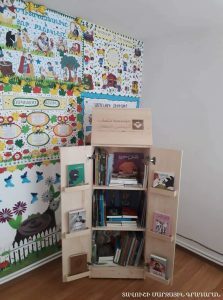 “”IBBY Armenia” makes great efforts to unite children around the book, – added R. Tonoyan, highlighting that the library is already a member of IFLA. 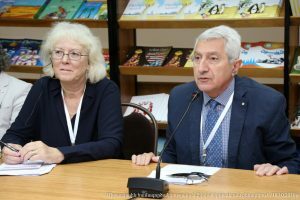 The speakers were the representative of IFLA and IAML, the head of the UFFICIO Ricordi Music Foundation Massimo Gentili Tedeschi, one of the top five of IBBY Shortlist for the 2018 Hans Christian Andersen Awards Iranian children’s writer Farhad Hasanzade. 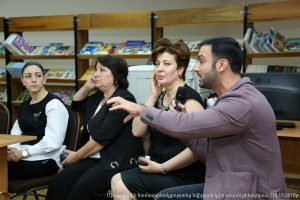 Director of National Library of Armenia T. Zargaryan, director of Isahakyan Central Library H. Karapetyan, other participants of the discussion-children’s writer A. Serobyan, N. Arzumanyan (Nor Nork Central library), S. Hovhannisyan (“Arevik” publishing house), S. Karapetyan ( “Edit Print” publishing house) spoke on library work, professional education, problems of children’s writing, the role and meaning of the book in RA. 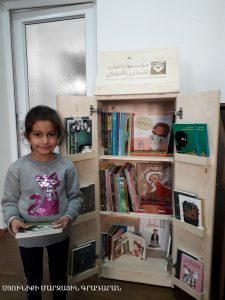 In 2018 due to cooperation of ALA and Kalimat foundation for Children’s Empowerment, the foundation will donate 1000 Arabic books to the RA libraries. 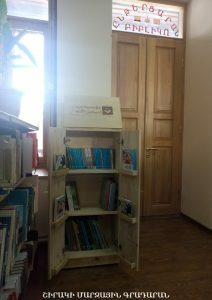 On October 19, 100 Arabic books were donated to the National Children’s Library after Khnko Aper, Nor Nork Central , Armavir and Aragatsotn regional libraries together with beautiful mobile bookshelves. 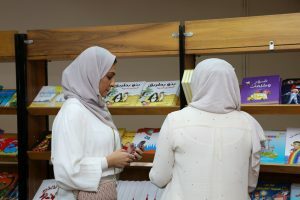 Soon other libraries will be replenished with Arabic literature through coordination of ALA. Replenishment of libraries with Arabic literature provides opportunity to study Arabic and get acquainted to Arabic history, literature, art and culture, living and traditions in original language. 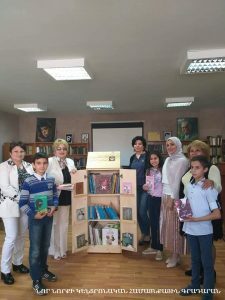 Let us mention, that Kalimat Arabic foundation was in Armenia thanks to the initiative of IBBY UAE. 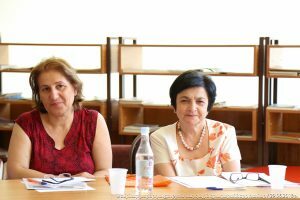 In the year of 2004 RA government fixed the establishment day of the Armenian Library Association as the Librarian’s Day. 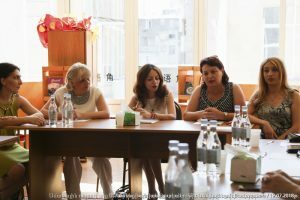 It is traditionally celebrated by various professional and cultural events in RA. 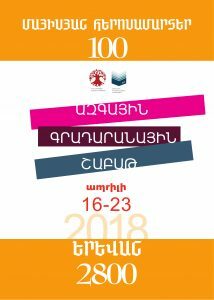 This year it has the “Path With A Book” heading and it is dedicated to the 100th anniversary of the First Republic of Armenia and 2800th anniversary of the foundation of Yerevan. 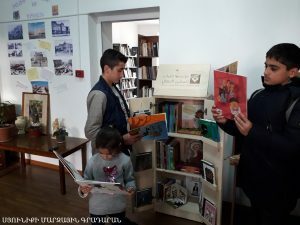 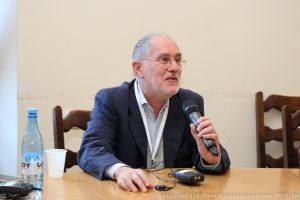 This year various events will be implemented again, which once more will draw public’s attention to the problems which libraries are facing and will articulate the librarians’ contribution in the promotion of reading and in the appreciation of books in the libraries of Armenia and Artsakh. 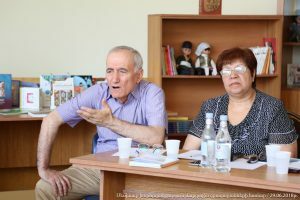 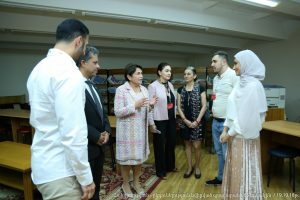 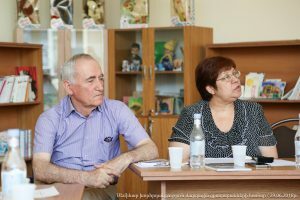 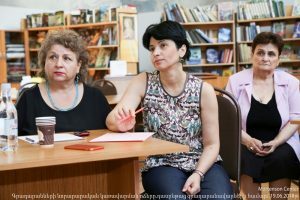 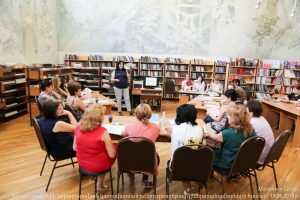 On July 2018 at the National Children’s Library within the framework of IFLA’s “Global vision” discussion series’ a seminar-discussion by Armenian Library Association was implemented. 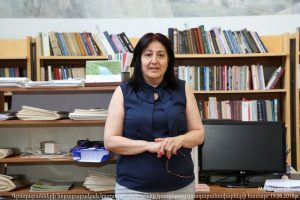 The Deputy Minister of Ministry of Culture N. Gharibyan, who was present at Paris meeting this year, presented the prehistory, aims and vision of the discussion series to the participants. 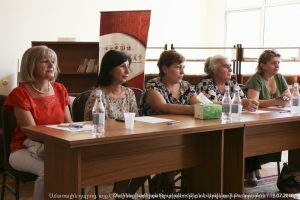 The librarians of different libraries answered to the questions of “Global Vision” discussion series on libraries’ future. 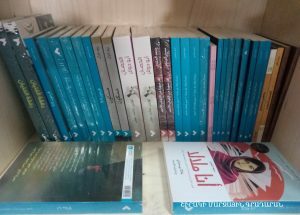 S.M.A.R.T. 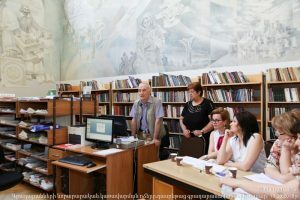 marketing program was presented during the seminar-discussion, with the help of which the participants described library’s bright future in interactive methods. 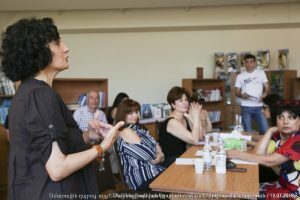 Vice-president of ALA R. Ghazaryan summed up the meeting: he answered to the questions of the librarians, told about the work of the association. 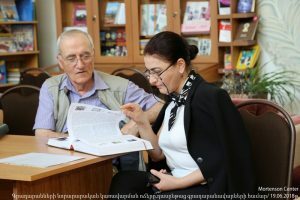 All librarians of RA libraries,with a view to recruiting their library collections, were given methodical manuals about reading organization and bibliography of children’s writer L. Sargsyan. 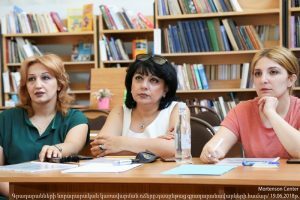 On June 29 at the National Children’s Library after Khnko Aper the Armenian Library Association organized a seminar- consultation on “Recruitment of Library Collections’ “, to which the librarians from sections of development and recruitment of RA regional libraries participated. 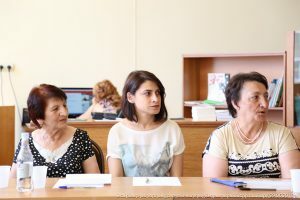 The situation and progress of library collections’ recruitment at RA regional libraries were presented by them. 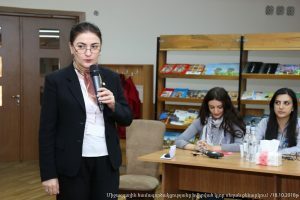 The head of section of development and recruitment of National Children’s Library after Khnko Aper R. Araqelyan spoke about “The Problems of Recruitment of Library Collections”. 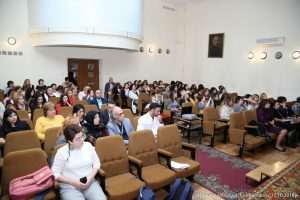 The seminar was followed with professional questions and exchange of thoughts. 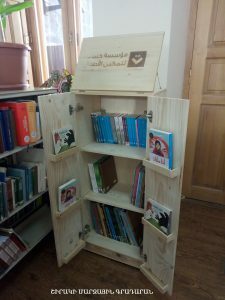 The librarians responsible for this library sphere presented relevant suggestions based on their working experience. 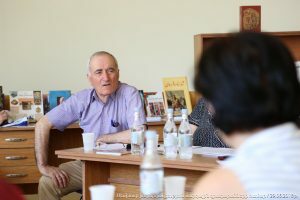 One-day meeting was summed at 4 p.m. : during the discussion a list of cardinal questions found their answers. 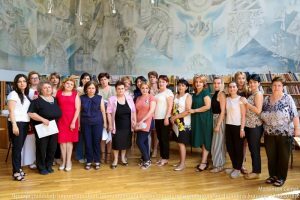 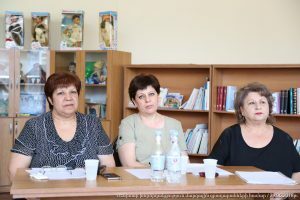 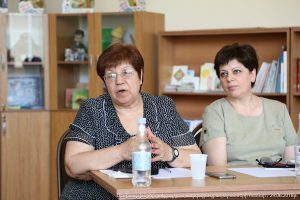 All librarians of RA regional libraries,with a view to recruiting their library collections, were given methodical manuals about reading organization and bibliography of children’s writer L. Sargsyan. 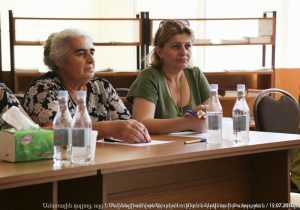 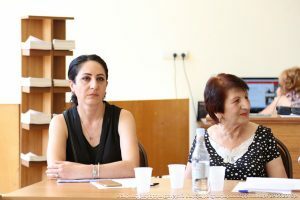 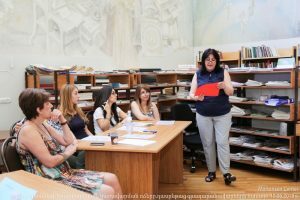 On June 19 at the National Children’s Library after Khnko Aper the Armenian Library Association conducted the “Libraries’ Innovative Management Methods” one-day training for librarians. 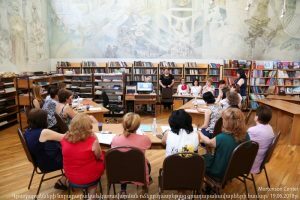 The aim of the seminar was to transfer the innovative skills and knowledge learned by the participants at the 2016 collaboratively organized same name training by ALA and Mortenson Centre for International Library Programs (Illinois University, USA) to other librarians of children’s library. 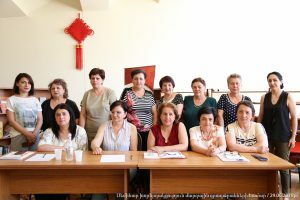 The training runners presented 4 innovative models, practical tasks, a video related to the topic was shown, and problems were put forward. 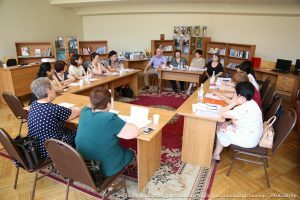 A professional meeting consisted of practical and meaningful discussions, the participants expressed several new theoretical-practical tasks and ideas for making library work better. 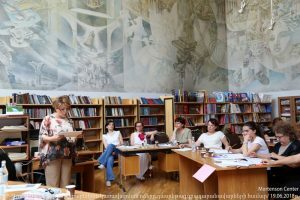 Let us mention, that the same thematic training will be soon held for the regional librarians. 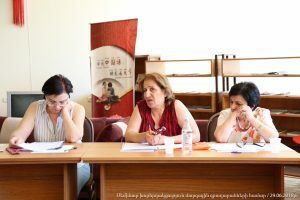 On the 16-23th of April 2018 the Armenian Library Association will implement traditionally celebrated National Library Week at RA: this year it is devoted to May battles and Erebuni-Yerevan 2800th anniversary. 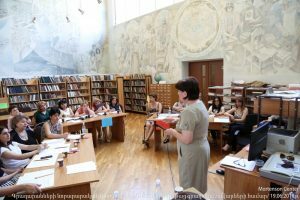 Since 2002 the task of professional-cultural week, implementing annually by ALA, is targeting, speaking out the library issues and searching comprehensive effective solutions. 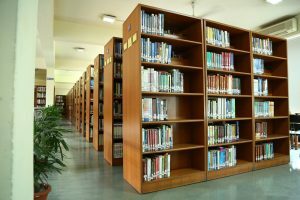 NLW has a tendency to promote the stimulation of interest towards libraries, book and reading and evaluating the importance of libraries in the public’s life. 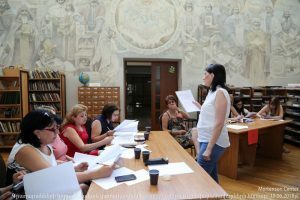 Annual organization of “week” expects effective cooperation between libraries, workers’ attention acting in the spheres of book and information towards library work, as well as strengthening library-public connection. 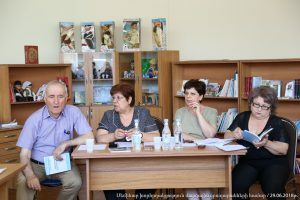 Target groups are readers, library workers of informative-bibliographic spheres, intellectuals… The program will launch from April 16: with separate programs will participate republic’s regional, community, professional, higher educational institutions libraries, which in advance informed about the implementing terms and got the designed posters appropriate to year’s content. 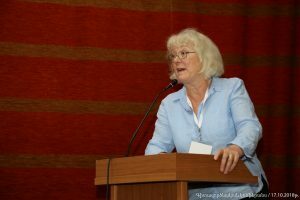 The week will be summed up at April 23. 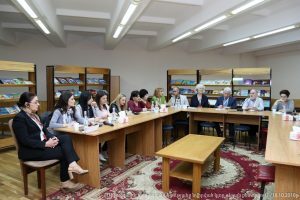 On the 28th of February 2018 the members of the Armenian Library Association NGO vice president R. Ghazaryan and G. Karapetyan visited the regional centre of Ararat to see the activity of RA Ararat region Artashat Municipality’s “Library system” CNCO. 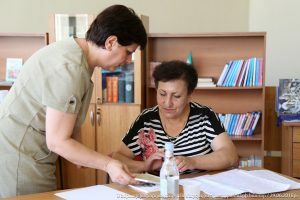 The motive of visit was an information-letter (23.02.2018) sent to director of ALA R. Tonoyan from director of “Library system” CNCO S. Petrosyan, which is acting under dependence on Artashat Municipality, where she expressed her anxiety about further activity. 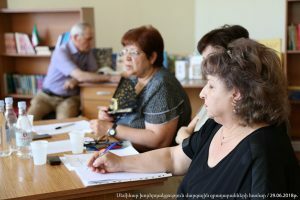 *Artashat’s Municipal CLS (Centralized Library System) cannot be called “Library system” without branches, which causes contradiction of legal and actual facts. 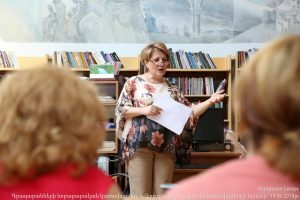 *In 2015 the CNCO got the status of public library by Ministry of Culture, which is a legal base for system’s whole activity. 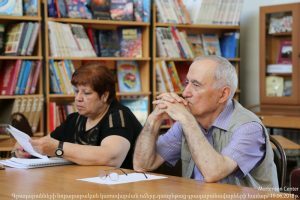 *The reading society of Artashat’s mentioned addresses protest and require to open both 2 branches and continue library service for young adults. 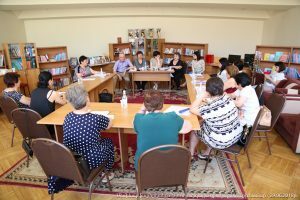 The Municipality as a result of ALA members’ visit, taking as a principle above mentioned bases, gave an order to reopen and continue the activity, also appropriated 1 rate of charge salary, which will be distributed among librarians working in 2 branches. 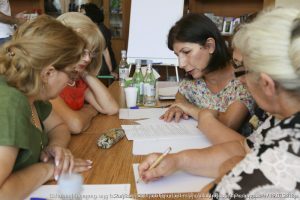 Observing above-mentioned problem’s positive outcome as important achievement of ALA activity – association will continue doing his mission promoting the protection of reading interests with caution and succession.